Every business wants results. And, they want them quicker than ever before. Yet, having an ever-increasing ability to scale revenue and business growth isn’t easy. Quick results are rarely sustainable – tactics and activities will be adopted that have limited ability to ever reach the scale desired, but may drive some initial results. Being able to reach ever increasing audiences, on more channels, with greater efficiency takes time in building capabilities and competencies. It doesn’t happen overnight and unfortunately, there isn’t a quick fix. In fact, I can’t even count the number of times a CMO has pressured timescales. For a journey that takes typically 3-years, most CMO’s request 3 quarters, with some aiming for 3 months. Not meeting these deadlines isn’t for lack of trying or lack of desire, but the level of effort making changes across a wide of disciplines, stakeholders and teams is a job in itself. The need to transition mindsets, operating models, teams and resourcing, technology infrastructure, processes, planning and budgeting is a huge ask and there is no silver bullet. When working with many clients that want to increase scale, efficiency and commercial impact from marketing, we’d be ignorant not to see common patterns and trends. Success leaves clues and patterns that high-performance businesses demonstrate, highlighting best-in-class marketing functions. Each time the challenges feel unique to both the individuals and their business, but in fact, they exist across other organizations with similar structures and maturities. 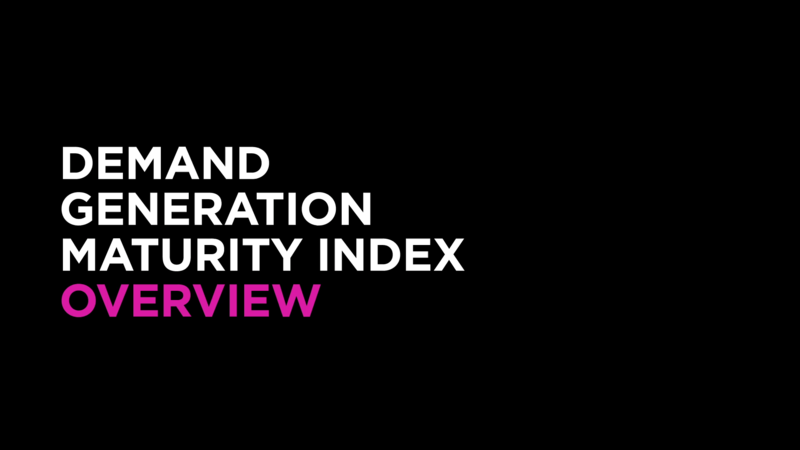 In order to guide conversations and manage expectations, we developed the Demand Generation Maturity Index. The index provides 4 main use cases for clients. Helps clients assess where they currently are. In doing so they have an anchor point to refer back to reflecting on progress. Gives a simple structure to help prioritize and focus on specific competencies important to execute against their strategy. This is particularly helpful if a few areas are weighing down overall marketing impact. Remember, best-in-class marketing teams are heavily built around the sum of the parts being greater than individual elements. Within focus areas and competencies, the path to enhancing capabilities is typically consistent across clients. Knowing where you currently stand, makes it easier to plot future steps in key areas. A clear structure around competencies which identifies the capabilities, features and behaviors that best-in-class businesses have is possible. This also creates a great reference point that feeds into the roadmap. One important distinction is that the Demand Generation Maturity Index is not actually built around MQL numbers, revenue generated, or marketing influenced pipeline results. But is instead about the maturity in which you go to market. Having greater maturity ultimately leads to better results through increased productivity, effectiveness of activity and scalability of impact. I often compare this to training for a new sport – you don’t always play a competitive match and the scoreboard is only one indicator of improvement, especially when just starting out. Training will differ by position as each person aims to build the skills and capabilities most suitable for their role. You’ll also have differences based on the team, their skills and competencies, and how you all to fit into the overall team. Then, each team also has different styles, so they’ll prioritize different needs based on the team strategy. Marketing teams are no different! Functional skills will be trained differently based on their position and as a result, individuals’ will want to prioritize different areas. The key thing is agreeing on an overall priority that fits with the marketing and business strategy. Over time, your competitive performances will improve through doing the right things and developing capabilities. But this is only as a result of training based around an effective strategy. In any sport, you’ll get a coach or manager who has done this before, and you’ll model the training and skills that professionals possess in order to build capabilities. The Demand Generation Maturity Index helps to outline this in much the same way for B2B marketing teams. If you’re adopting the proven behaviors and features that lead to high performance, the results will improve as your capabilities grow. The organization category focuses on three factors critical to achieving marketing goals; approach, alignment and communication. But of course, this isn’t possible if all teams and functions are chasing different goals, with different priorities, in different ways. You need everyone on the same page, pulling in the same direction. One of the aspects that makes this especially challenging is that there is often a large element of change management needed to deliver against the strategy. Approach – Where are you in your adoption of modern marketing? Alignment – Does your business have a clear vision which it is moving towards collectively? Communication – How well do you inform and communicate marketing updates/performance? High performing companies do a great job of managing organizational alignment. Best-in-class marketing functions communicate transparently on commercial priorities, fully understand their operating model, adopt common ways of working and consistently communicate the commercial impact of marketing activity. As a result, they achieve optimal efficiency and full attribution throughout the sales cycle along with alignment around priorities across the whole team. See the detailed overview of the features that best-in-class marketing teams possess. In order to be able to deliver at increasing scale, operationalizing marketing is vital in driving both efficiency and productivity in output. If everyone is working in different ways, you’ll have countless problems downstream. From increased errors, duplication and wasted time chasing information to reduced quality, manual workarounds and constant troubleshooting and fixes, these represent just a selection of common challenges experienced by teams with immature operations. Standardization – Do you re-use templates or re-create them when starting a campaign? Process Management – How consistent and streamlined are you in delivery? Contact Management – Is your contact data a risk or an asset? Lead Management – How effective are you at managing opportunities? Companies which are operationally best-in-class use robust templates, standards, and reusable elements. Governance is strong with adoption of processes widespread across the business. Typically, these organizations also achieve two-way lead management between Sales and Marketing, implement workflow automation with built-in asset and processing templates, and optimally enrich contact data at the point of capture. How Mature Is Your Demand Generation Operation? 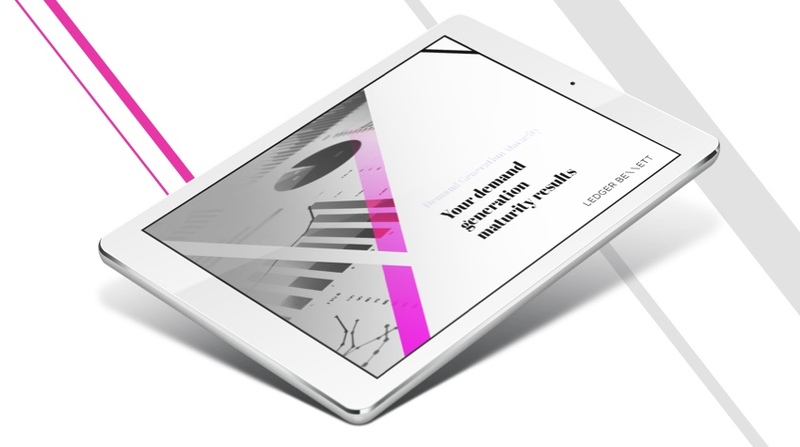 Our Demand Generation Maturity Index summarises your current capabilities, highlights opportunities for quick wins and areas for improvement. Nurture – Do you have an engine that builds lead readiness? Acquisition – How effective are you at filling the top of the funnel? Engagement – Are you making changes that improve engagement? Best-in-class companies execute marketing campaigns across a wide range of channels in the media landscape. By continually testing and improving engagement of content and activity, they build a high performing base with predictably in delivering net new leads. Automation and programmatic capabilities scale delivery whilst an always-on nurture program across channels result in world-class campaigns being produced and executed as standard. ABM – How effectively can you market to accounts, not just contacts? Measurement – How accurately do you understand the performance of your marketing activity? Revenue – How effectively can you link and optimize performance for revenue? Insight – How data-driven are you in your approach to planning? Optimizing output at every opportunity, best-in-class marketing teams effectively use and apply data. Developing predictability in leads and revenue generated by marketing, ROI models are built. High maturity links budgets to performance and maximizes conversion rates around accounts where optimal returns are achieved. We’ve briefly covered the 4 main categories in Demand Generation but there’s no one size fits all path. Differently shaped businesses have different priorities based opportunities in the market. What is important is knowing the levers which will give you the ability to grow results, both now and in the long term. Plus, the critical steps to be able to get there as quickly as possible, avoiding errors and accelerating progress based on the experience of those that have gone before you. To assess where you are today, see personalized recommendations for your next steps and see how stack up against best-in-class companies, take the Demand Generation Maturity Index today.